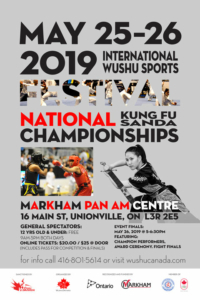 We welcome you to the biggest event of the year – the 2019 Wushu Festival and National Championships! WushuCanada and the entire community look forward to welcoming you with open arms to the great City of Toronto and the Town of Markham which has been a proud host to event in the past several years. We proudly look forward to selecting our team for the prestigious World Championships to be held in Shanghai, China this year; and as well look forward to the preliminary selections of our athletes for the 2020 Ontario Winter Games. New this year we have an exciting Wing Chun Combat Division known as Ma San Jong, which incorporates the skill sets of Wing Chun KungFu in a uniquely designed rule set that offers a high intensity challenge for participants within a safe and controlled confines of Internationally accepted rules. Schedules: will be available in May, 2019 for download. NOTE: Sanda Free Fighting Events Begin Saturday, May 25th 1-4pm, please ensure athlete arrival prior to noon. NOTE: Wushu Taolu Duilian Fighting Set events will be held during the gala event. Taolu Draw Lots: Draw lots are computerized and randomized by our system provider. The process will be completed May 19th, 2019 and will be conducted by our Technical officials, it will not be held a day prior to the event. Sanda and Ma San Jong Bout Draws: Sanda bouts and weigh in will be conducted between noon and 1pm on Saturday, May 25th, 2019. It is the responsibility of athletes to be +/- 2 lbs of their indicated weight. Any variance will result in potential disqualification. Athletes in Class B & C will not have weigh in issues within 5lbs of their registered weight. Note that being heavier will have no advantage in our matchmaking process. Sanda and Wing Chun Ma San Jong: Please ensure you have a mouth guard and groin protector. As this is an early season event and first experience for many fighters, all bouts will be strictly overseen by our platform judge and head judge to ensure a safe and enjoyable learning experience for all participants. In addition to official bouts, we will arrange several training bouts to aid in the development of our first time fighters and junior athletes. Training bouts will be shorter in length and contact levels will be enforced to the comfort of each athlete. Judges Meeting shall be held Friday, May 24th, 2019 at 5:00pm-8:00pm at the WushuOntario headquarters. Coaches may choose to attend at 7:00pm. GOOD LUCK TO YOU ALL AND WE WISH YOU THE BEST AND MOST ENJOYABLE EXPERIENCE!